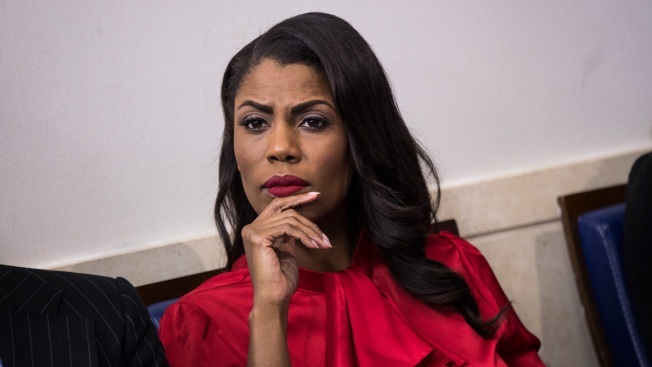 A file photo on then Director of Communications for the White House Public Liaison Office Omarosa Manigault at the White House, October 27, 2017, in Washington, D.C.
Former President Donald Trump aide and "Apprentice" contestant Omarosa Manigault Newman has a memoir coming that her publisher calls "explosive" and "jaw-dropping." The book is called "Unhinged." Gallery Books announced Thursday that it will be released on Aug. 14. On Friday, Manigault Newman tweeted "#ComeClean45" and shared a link to a book listing on Amazon promoting pre-order sales. Manigault Newman was a Trump ally who joined his administration in January 2017 as a White House communications director. She had vowed that political foes would "bow down" to Trump. But she left after a year and spoke harshly of her experience, while denying reports she was fired. She said she was worried about the country and would never vote for Trump again. The rare black woman in Trump's administration, she has likened her departure to being freed from a "plantation."